We're pleased to announce that our innovative smart plug products are now fully supported by the Google Assistant on Google Home and eligible Android phones. This announcement further delivers on our unique commitment to ensuring the iHome Control™ product line is compatible with all leading IoT and AI platforms. Users of Google Home and Android phones will now be able to connect their iHome smart plug products to their Google Assistant enabled devices and seamlessly turn connected appliances on or off by voice thanks to the Google Assistant. iHome makes it easy to create and maintain a smarter, safer and more energy efficient home, regardless of what IoT platform is being used. iHome smart plugs turn devices plugged into them into smart devices. When used with the Google Assistant on Google Home, customers can use simple “Ok Google” commands to control their iHome Smart Plug and connected appliances. They need only say, “Ok Google, turn off the bedroom light” or “Ok Google, turn on the living room fan” to operate that device. Our smart plug products are compatible with several leading IoT platforms including Amazon Alexa, Apple HomeKit, the Google Assistant, Nest, Samsung SmartThings and Wink. Meet Gray Harvest, a duo of singer/songwriters that are quickly building a buzz with their new single, “We Are One”. Based out of New York City, the band recently trekked up to the mountains of the Hudson Valley to ‘unplug’ and create some acoustic magic. We caught up with bandmates Isaac and Abie to learn more about the new song, and what makes these musicians tick. When writing their songs, Isaac and Abie share a number of artistic influences from across the rock n’ roll spectrum. From Dave Van Ronk to Lou Reed and beyond, Gray Harvest employs musical elements from a variety of styles. With no gimmick or image to hide behind, the guys in Gray Harvest strive to connect with their listeners on a basic human level. They hope their music inspires others to evolve through their own creative experimentation, too. “Being honest with myself, and asking myself the "scary" questions in order to grow, that connection with the listener is as much as I feel I can do as a songwriter”, Isaac declares. Check out “We Are One”, which is available now on iTunes, Spotify, and SoundCloud. Stay tuned for a new single in April and a full album release this summer! We are pleased to announce that iHome was honored with an Innovation Award at this year's Consumer Electronics Show in Las Vegas. The iZBT5, a new sleep therapy speaker from the iHome Zenergy line, was lauded for its cutting-edge technology and sleek design. The iHome Zenergy line creates a calming environment anywhere using a combination of light and sound therapy. The iZBT5 features 6 different sound therapy tracks designed to calm your mind, lower your breathing and heart rate, and prepare your body for sleep. You can also select from 6 different 200 Lux, full-color light therapy modes designed to align your circadian rhythm at night, and improve your mood throughout the day. The iZBT5 features three different audio sources: built-in sound therapy, Bluetooth wireless audio streaming from your mobile device, and Aux-in jack. Its compact, rounded shape and rechargeable battery make it perfect for travel, too. Plus, you can create your ideal relaxation environment using the iHome Zenergy App. Learn more about this award-winning product here! iHome is proud to introduce Zenergy, a line of portable and bedside Sleep Therapy machines designed to promote healthier sleep cycles by utilizing proven sound and light therapy techniques. Endorsed by Dr. Michael Breus, aka “The Sleep Doctor,” Zenergy leaves users feeling more energized during the day following a quality night of rest. The Sound Therapy feature uses specially recorded and engineered sounds to cancel out distracting noises and help alleviate racing minds, leading to better sleep at night and more focus during the day. Light Therapy, meanwhile, helps to align our circadian rhythms, or internal clocks, by simulating the changing wavelengths of light throughout the day that would naturally govern it. Having exposure to these wavelengths of light at the appropriate times can trigger subtle biological responses like increased melatonin production and a more relaxed heart rate at night, and increased energy and improved mood during the day. ● Designed for use in the home, the iZBT10 helps users sleep restfully and wake energized with customizable combinations of ten sound therapy presets and ten specially designed 1000Lux, 360-degree light therapy and color-blending programs. Additionally, the iZBT10 will feature Bluetooth connectivity, FM Radio, dual alarms and sleep timers, and a USB charging port for mobile devices. ● A CES 2017 Innovations Award honoree, the lightweight, portable iZBT5 is designed to help travelers rest easy. Boasting six sound therapy presets and six light therapy and color-blending programs, the Bluetooth-enabled, rechargeable device is the perfect companion for travel, office, school studies, or any area in the home. Comes complete with charging accessories and a removable lanyard for convenience. Put those cables away, because iHome is proud to present the iBN350, the first alarm clock featuring an integrated Qi conductive charging platform. See how easy it is to wirelessly charge compatible devices like the Samsung Galaxy S7 and other popular Android smartphones, simply by laying your phone on top of the clock's built-in platform. The iBN350 also employs NFC (Near Field Communication) technology, which instantly connects NFC-enabled devices with Bluetooth so you can stream your favorite playlists via high-quality audio without skipping a beat. Plus, the iBN350 comes equipped with a microphone that lets you answer and end calls via the convenient speakerphone feature, so you can always stay connected. This dual alarm clock is the perfect bedside unit for tech savvy smartphone users. It even includes an extra 1 amp USB port for charging another device, too! Learn more about this Qi wireless charging innovation, only at iHome. Meet our latest line of color-changing speakers - they're ready to party, wherever you go! Featuring a variety of fun and fabulous color modes, these portable speakers pack quite a powerful sound, too. Wirelessly stream your favorite music via Bluetooth and enjoy a rich, detailed audio experience with every song. Plus, each color-changing speaker also comes loaded with speakerphone features including a built-in microphone, echo cancellation, and answer & end controls. Best of all, the rechargeable battery lets you enjoy hours of uninterrupted dance party playlists! See all the cool features of the iBT84 and iBT682, and keep an eye out for even more innovative products from iHome! Explore the great outdoors this summer with our variety of waterproof, shockproof, and dustproof Bluetooth speakers from iHome. Our Weather Tough line of portable speakers were designed with the most rugged adventurers in mind, so these durable models are built to withstand even the most severe outdoor elements. Whether you are hiking, biking, climbing, or simply relaxing poolside this summer, you can enjoy high quality audio as you wirelessly stream your favorite playlists from any Bluetooth enabled device. Each Weather Tough speaker also comes loaded with speakerphone features including a built-in microphone, echo cancellation, and answer & end controls. Music and make-up go hand in hand with this innovative vanity mirror from iHome. Look your best while wirelessly streaming your favorite music via Bluetooth, and answer calls with ease using the built-in speakerphone. Plus, there's a USB port to charge your phone as you prepare for your day! The double sided distortion-free mirror features 1 to 7x magnification, and full spectrum color lighting means whatever light you’re in during the day, you’ll always look good! Our iHome vanity mirrors have been featured on the Wendy Williams Show, and have caught the attention of popular beauty mavens across the social media world, including Cara Loren, Camila Coelho, Melissa Alatorre, and Chriselle Lim. Meet the iHome iBT29, a Bluetooth-enabled alarm clock with a difference, adding excitement and color to your music. Perfect for parties or setting the mood while listening at home, you can stream wireless digital audio via Bluetooth from your iPhone, iPad, Android, Windows or other Bluetooth-enabled devices. Intelligent control of your home starts with the iSP5 Smart Plug, the latest home automation innovation from iHome. Connect products such as lamps, fans, or humidifiers and control them remotely while you're home - or even when you're not. This WiFi enabled SmartPlug is compatible with both Apple and Android devices, and is designed to work with Apple Home Kit, Wink, and Nest platforms. The iSP5 also comes highly recommended by iLounge, who hailed the Smart Plug as the "Best Home Accessory of the Year" in 2015. Watch the video below and see how easy it is to control music, lights, fans, heaters and more - all via your smartphone. Go wireless with these stylish Bluetooth headphones from the audio experts at iHome! Ditch those inconvenient cables and cords - these headphones let you stream rich, high-quality audio from up to 30 feet away! Plus, a remote control on the earcup makes it easy to navigate tracks, control play/pause, and adjust volume levels with the push of a button. The iB87 also features a built-in microphone and speakerphone setting, so you can always stay connected, no matter where your music takes you. Cheers to High Quality Audio - Meet The SoundFlask Collection! Let's make a toast to your favorite playlists! iHome's new SoundFlask series offers sleek rechargeable Bluetooth stereo speakers that look as great as they sound. Wirelessly stream rich, high-quality audio from your iPhone, Android, or other Bluetooth device, anywhere you go! Each SoundFlask also comes equipped with a built-in microphone and answer/end controls so you can always stay connected via speakerphone. Plus, the added AUX port allows you to play music from nearly any audio device. And don't worry, there's no ID required for the iBT12 or the iBT32. But please, listen responsibly. We are pleased to announce that the third annual TWICE VIP (Very Important Product) Awards have selected the iHome iKN105 as the Best In-Room Speakers of 2015! Winners were determined via an online poll, with votes from both retailers and distributors in the consumer electronics world. iHome has teamed up with Mad Decent Block Party to co-host a series of summer shows in 22 cities across North America. The line-ups vary by city, featuring performances by artists including Diplo, Big Gigantic, Dillon Francis, Fatboy Slim, Flume, Sleigh Bells, and more. See all dates below, and download the free Mad Decent Block Party app for iOS and Android for a chance to win a VIP trip on the Mad Decent Boat Party! Find an Android docking station to suit your style at iHome, your source for high-quality home audio systems. See our selection of Android docking station models including the iC50 and the iC3, available now! If back in the day you were a Sumerian king, a very cool gift would have been a 'first generation' tablet (stylus included) with anti-glare display that was fully mobile and wireless, albeit a bit on the heavy side. The tablet has evolved over several millennia, and Apple is credited with revolutionizing the modern day device with the release of its Apple iPad in April 2010. In its first month, Apple sold one million iPads. Reson8® sound technology for an exceptional audio experience. NXT™ stereo speakers provide great sound - perfect for music, games, videos or apps. 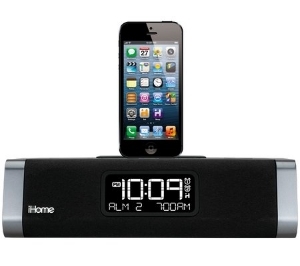 If you are looking for great sound for the iPhone/iPod/iPad this holiday season, check out iHomeAudio.com for the best holiday gifts for 2013. As the #1 brand in the iPod Electronics market, we offer full lines of alarm clocks, clock radios, portable speakers, home audio systems, headphones, and a licensed line of iPhone/iPad/Mac accessories. Wake Up To This Awesome Holiday Gift Idea! Need a great gift for that hard- to-buy-for (H2B4) person on your shopping list? iHome Audio has got you covered. Priced right at just $99.99, the NFC Bluetooth Stereo FM Clock Radio and Speakerphone will get that H2B4 person out the door on time every morning with a smile on his/her face. If that H2B4 person also happens to be a hard-to-wake-teenager (H2B4 + H2WT) this gift rocks! The lucky recipient of this fully featured bedside alarm clock will be able to start or end their day just the way they want it to sound, with twin speakers for room-filling sound. The specially designed sealed speaker enclosures deliver astounding clarity, depth and power. Two independent alarms let them wake to Bluetooth audio, built-in tones, FM radio, or buzzer with 7-5-2 alarm settings for full week, work week or weekend with separate wake times/alarm sources to suit their lifestyle plus gradual wake and gradual sleep and programmable snooze time between 1 and 29 minutes. This innovative clock is a terrific holiday gift option because it has USB charging wireless stereo audio streaming over Bluetooth and NFC (near field communication) technology instantly connects NFC-capable devices to Bluetooth. Your H2B4 person will not only be able to stream wireless digital audio via Bluetooth from their iPhone, iPad, Android, Blackberry and most Bluetooth devices but they’ll also be able to take calls with wireless speakerphone over Bluetooth. The speakerphone features integrated microphone, ATI SoundClear voice echo cancelling and answer end call controls. FM radio or line-in audio. A 2.1 amp USB port and 2 device rest inserts keeps all of their mobile devices charged and ready to go. Save on all of your holiday shopping this year with FREE UPS Ground shipping within the Continental USA on orders of $60 or more (Not applicable with other iHomeAudio.com promotions or discounts). Next Day and Second Day service are also available. Best Holiday Gifts for Teens, Then and Now! Finding awesome holiday gifts for teens and tweens has always been a bit of challenge. Choosing the perfect gift for kids back in the 1980’s was no less difficult. With the 2013 holiday season just around the corner, today’s parents are already scratching their heads wondering what gifts they should buy for their kids this year. Today’s teens continue to be music-obsessed and audio gifts are predicted to be the most preferred gifts for teens and tweens in 2013. · Bluetooth Wireless Headphones with Mic, Remote Control and Pouch - iB85 - Listen to audio from up to 30 feet away via Bluetooth wireless capability. Plus, teens will love the built-in mic that makes wireless phone calls a breeze! · Dual Alarm Clock Radio for iPad, iPhone and iPod - iDL100 - Charge three devices at once via two flexible Lightning docks plus a USB port. Wake and sleep to iPad, iPhone or iPod, to a custom playlist, or to FM radio. How's that for variety? · NFC Bluetooth Stereo System with Speakerphone - iBN26 - Stream wireless audio from your iPhone, iPad, Android, Blackberry and more. Tech-savvy teens with NFC-capable devices can instantly connect via NFC technology. · Bluetooth Portable FM Stereo Boombox with USB Charging - iBT44 - Retro style meets modern technology. The perfect boombox for any teen who loves a good dance party! · NFC Bluetooth Stereo FM Clock Radio and Speakerphone with USB Charging - iBN97 - Wirelessly stream audio and take calls via speakerphone - all in high-quality sound! Great all-in-one speaker system for bedrooms & dorms. · Space Saver FM Stereo Alarm Clock/Charger for Kindle Fire®- iK50 - Charge and play your Kindle Fire® with this compact speaker system that delivers powerful sound beyond its size! · Bluetooth Rechargeable Mini Speaker System in Rubberized Finish - iBT63 - Take your tunes anywhere with these portable, rechargeable Bluetooth mini speakers that any teen will love! · Rechargeable Portable Bluetooth Speaker with Speakerphone for iPad/ iPhone/iPod - IDM11 - This stylish mini speaker is sure to turn heads all over the teen scene. Enjoy high quality sound that’s perfect for your music, games or apps. · Retro-Style Hi-Fi Stereo Headphones - RT62 - Try these vintage-style headphones on for size, available in two bold colors! Jamming out to your favorite tunes never looked - or sounded - so good. · Portable Rechargeable Bluetooth Music Receiver with Speakerphone and Home Docking Station - iBT52 - Turn any speaker system equipped with a line in jack into a wireless Bluetooth system! · Sleek Stereo Speaker System for iPad, iPhone, iPod or other Audio Devices - iDM1 - Connect to any audio device that has a headphone jack, and the convenient backrest makes watching movies on your tablet easy and hands-free! · Rechargeable Portable Speakers with Travel Case/Stand for Kindle Fire® - iK8 - This portable speaker system with included travel case is ideal for any electronic-savvy teen on the go! · High Performance Noise Isolating Earphones with Inline Mic and Volume Control - iB27 - These ultimate earbuds for teens feature an inline mic to answer and end calls and includes noise isolating ear tips in a variety of sizes. · AM/FM, AC/DC Portable Dual Alarm Clock Radio - RT212 - Bring back the retro look with this dual alarm clock radio available in 3 vibrant neon colors! Find even more affordable gifts that teens want at iHome! Mothers are special and when the holidays come around, you’ll want to be ready with the perfect gift for her. This holiday season, give Mom a gift she can enjoy throughout the year. At iHomeAudio.com, you’ll find a huge selection of innovative products that every mom will love! iHome is the #1 brand in the iPod Electronics market and carries a full lines of alarm clocks, clock radios, portable speakers, home audio systems, headphones, and a licensed line of iPhone/iPad/Mac accessories. Mom will wake up each morning with a smile on her face with this top-selling product. Two flexible Lightning docks plus a USB port will let her charge three devices at once. Plus, she can wake and sleep to iPad, iPhone or iPod, to a custom playlist, or to FM radio. The size-defying sound of this dynamic duo will keep mom light on her feet! The remarkable design of these powerful speakers will fit in the palm of her hand and connect to a computer or other USB power source via the included USB cable to recharge the internal lithium ion battery. Perfect for laptops, cell phones, iPad, iPhone, iPod and other MP3 players. If mom has been borrowing your headphones when you’re not home, it’s time to surprise her with a set of her own! Mom will surely enjoy rich, detailed sound and enhanced bass response emanating from these quality headphones and she will especially appreciate not being tethered to bothersome cables and cords. The Bluetooth wireless capability will allow Mom listen to audio from up to 30 feet away, while the built-in mic will give her wireless access to phone calls. Plus a remote control on the earcup puts track control, play/pause, answer/end calls and volume control within easy reach. The foldable headband, USB charging cable and included travel pouch provide added portability for moms on the go! Sporty moms will love these fabulous earbuds! Lightweight and durable, these sport earbuds offer rich sound and quality construction and are perfect for the gym or mom’s early morning power walks. A carbiner clip cord wrap lets mom keep it all together with convenient earbud storage and total control on the go. Three sets of comfortable interchangeable foam ear cushions in different sizes and colors provide perfect fit and style to match any look. Features include a 20 inch cord, a cord clip to keep your earbuds close to the body and a cord slider for comfort and safety. For moms who love to entertain, the iW3 AirPlay wireless speaker system is the perfect gift! This speaker system uses a Wi-Fi network to connect and control her iTunes library (Mac + PC) for wireless audio anywhere in the home. Rechargeable Lithium-ion battery for portable placement. The iW3 also supports USB for charging and music playback of iPad, iPhone and iPod with any iPod USB sync cable. This sound machine is a blast from the past and is a great gift for moms who won’t leave home without their tunes! The iP4 is a re-imagining of the classic stereo boombox with intriguing updates for her iPhone and iPod. The iP4 features SRS TruBass digital signal processing technology and 5 band EQ coupled with 4" carbon composite woofers and 1" ferro fluid cooled tweeters for sound that has to be heard to be appreciated. FM radio and aux line-in jack. Operates on 6 D batteries or included AC adaptor. A handy clock radio for moms that travel, the RT212 is a dual alarm clock radio that lets you wake to AM/FM radio or built in buzzer. Featuring retro styling, this unit is eye-catching and fun, featuring a dynamic wide range speaker for exceptional sound. · iHome Sleep for Android - This is a cool App for moms with Androids. The Sleep for Android is the newest version of iHome's acclaimed sleep lifestyle app. Sleep is a free download that provides users a rich alarm clock manager with custom wake and sleep sounds, a full screen clock display with customizable background and weather information, sleep log and statistics, Overnight News, and much more. This innovative Bluetooth speaker system with a removable iPad stand and a built-in lithium-ion rechargeable battery will definitely get you some extra brownie points from mom! Two (2) active speaker drivers and one (1) passive radiator provide excellent sound in a small package. 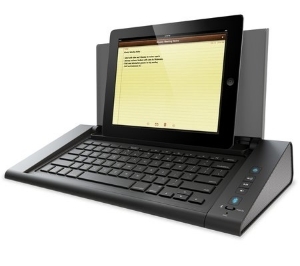 The iPad stand, compatible with both the first generation iPad, and iPad 2, has fold out feet for added stability and attaches magnetically to the speaker for travel. When mom needs a little time to relax, give her a “Do Not Disturb” sign for her door and this speaker system so she can have some time alone to enjoy music wirelessly via Bluetooth or wired with an auxiliary cable (included)! “Noise cancellation” these two words alone make this the best gift ever for mom! This complete headphone package is perfect for frequent flyers and other demanding listeners. Rich, detailed sound with enhanced bass response provides articulate audio. Active noise cancellation circuitry silences intrusive sounds (like whining children!) while the padded headband and ear cushions make extended listening a pleasure. A detachable tangle free cloth cable with an in-line dial puts volume control within easy reach. Adjustable headband with rotating earcups provide the perfect fit. Includes important extras such as airline adapter and travel pouch. Discover many more great gift ideas for mom, at iHomeAudio.com and celebrate the most important woman in your life this holiday season!